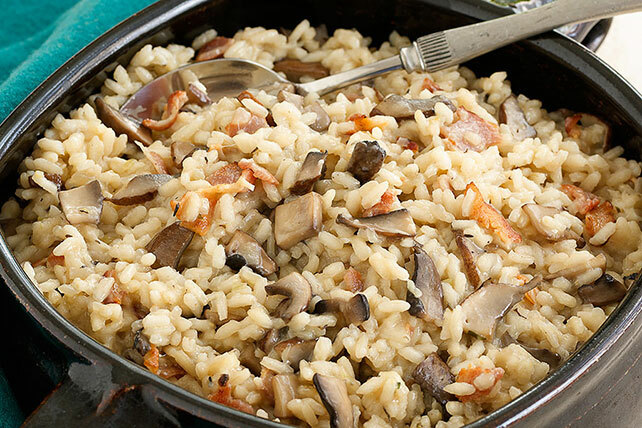 Fat-free reduced-sodium chicken broth helps make this glorious mushroom and bacon risotto bake a Healthy Living recipe. Place 2-qt. casserole in oven to warm. Meanwhile, cook bacon in large skillet on medium heat until crisp. Remove bacon from skillet, reserving 1 Tbsp. drippings in skillet. Drain bacon on paper towels. Add onions to drippings in skillet; cook and stir 3 min. Add mushrooms; cook 10 min. or until mushrooms release most of their liquid, stirring occasionally. Add rice; cook and stir 1 min. Stir in broth, thyme and pepper; bring just to simmer. Remove from heat. Crumble bacon; stir into rice mixture. Spoon into warmed casserole; cover. Bake 30 to 35 min. or until rice is tender and most of the liquid is absorbed. Add cheese; stir until melted. Substitute sliced cremini mushrooms for the chopped portobello mushrooms.